Imagine what if these lines by Pablo Neruda were not exchanged between lovers but jealous siblings. The shuddersome night would not have seen morning without any of them stripped off their identity. Broken Images, the psychological thriller written by Girish Karnad and directed by Alyque Padamsee, recreates the encounter between two shadows that try to take over each other’s body. Manjula, the elder sister publish her crippled sister Malini’s book under her own name after the latter’s death. Shabana plays Majula and Malini. Girish Kannad’s intricately-woven narrative is put on stage in flesh and blood as Shabana carries on with the monologue, one of the distinct features of plays written by Kannad. The play opens many possibilities. Was Malini the victim of Manjula’s spite or was she the one who deliberately defeats her elder sister in what she considered her own territory of writing novels? Is it that Manjula stole the novel written (in English) by Malini as she was insecure or did Malini want Manjula to steal the manuscript so that she could continue to run away from herself, even after her sister’s death? Perhaps Malini had forgiven Manjula. She named the novel The River Has No Memories. Was Manjula drowning in self-pity? During the first hour of the play, one reminiscences Shabana’s roles from the various movies she has acted in ~ the same tempo, the same fervour and the same conflict of emotions that reflect on her face. She, however, lacked the coldness of a calculative woman during the first few minutes of the play. The lights on the stage were horrible but by the time the glitch appeared, the audience was too engrossed to notice anything. What made Shabana take up Broken Images after a long leave from theatre? “Raell Padamsee, producer of the play, had seen the play with her father Alyque at Ravindra Natya Mandir three months ago and Girish Kannad had come down with the play as part of the Vinod Doshi festival. She wanted Alyque to direct the play. She wanted me to play the lead. He had directed my mother, Shaukat Kaifi Azmi, 40 years ago in another play and he immediately said yes. I liked the script very much. 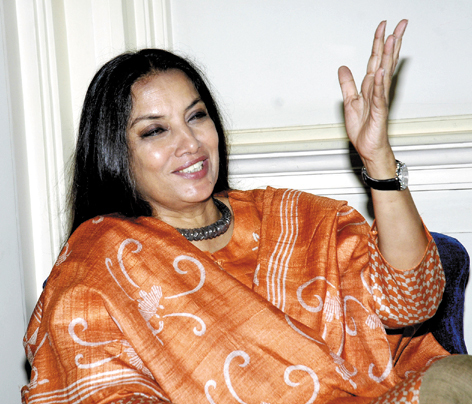 It’s wonderful doing plays with him,” says Shabana. Shabana is also in an international production titled Seven. It is a play by a feminist organisation ~ Vital Voices ~ in New York. In the play, seven real-life characters, women leaders from across the world, speak about their struggles. “I will play Inez McCormack who had a Protestant upbringing in Northern Ireland, married a Catholic and became a longtime activist for women’s human rights, labour and social justice. It’s the same part that Meryl Streep played in an earlier production,” she says. She has got five other actors on board, including Urmila Matondkar, Tannishtha Chatterjee, Tanvi Azmi, Jayanti Bhatia and Mahabanoo Mody Kotwal. Azmi is doing the play for free. “I was approached because of my work in the field of women’s rights. The play is about real women. Every single word we speak in the play are for women whose lives are restricted, threatened and often lost to violence,” she adds. Shabana will also start working for Deepa Mehta’s Midnight’s Children later this year. Girish Karnad’s Broken Images is directed by Alyque Padamsee. Event coordinated by Weavers Studio Centre for the Arts.